Authors: Astakhov S.Y., Tkachenko N.V.
Purpose to estimate the efficacy of “artificial tear” preparation on the trehalose base in dry eye syndrome treatment in cataract patients after phacoemulsification. Materials and methods: in 40 patients with incipient cataract phacoemulsification with IOL implantation was performed. During 1 week, all patients received eye gel with dexpanthenol in addition to postoperative therapy. Then, all patients were divided into two groups (randomization using envelopes): in the main group, the gel was replaced by Thealoz®, in the control group, the gel was discontinued. Special investigation tests (OSDI score, TBUT test, conjunctival hyperemia, corneal confocal tomography) were performed before surgery, in one week and one month after it. Statistical analysis was performed using SAS 9.4 program. Results: all investigated parameters had significant differences with time and between groups (р < 0.001). TBUT test result decreased in one week after surgery from 7.4 ± 2.1 to 4.6 ± 1.9 sec in the main group and from 7.5 ± 2.3 to 4.4 ± 2 sec in the control group. Return to baseline results in the control group was slowed down and made 6.4 ± 2.8 sec (compared with 7.9 ± 2.4 sec in the main one). In the trehalose group, OSDI score ameliorated from 35.1 ± 8.7 (in one week) to 14.2 ± 5.3 (in one month), in the control group, from 40.1 ± 11.5 to 24.8 ± 9. Conjunctival hyperemia was also less pronounced in the main group in one month after surgery: 0.45 ± 0.6 (1.6 ± 0.7 in one week), in the control group, these indices were equal to 1.7 ± 0.5 (in one week) and 1.3 ± 0.7 (in one month). Conclusions: Thealoz® use as a part of combined postoperative therapy helps to effectively fight against dry eye syndrome main signs and enhances treatment tolerance. trehalose, dry eye syndrome, phacoemulsification. Argüelles JC. Physiological roles of trehalose in bacteria and yeasts: a comparative analysis. Arch Microbiol. 2000 Oct;174(4):217-24. Baudouin C, Aragona P, Messmer EM, et al. 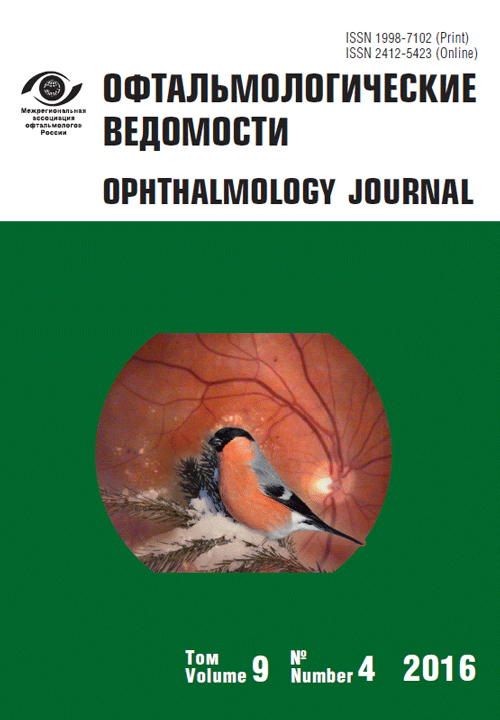 Role of hyperosmolarity in the pathogenesis and management of dry eye disease: proceedings of the OCEAN group meeting. Ocul Surf. 2013 Oct;11(4):246-58. doi: 10.1016/j.jtos.2013.07.003. Cetinkaya S, Mestan E, Acir NO, et al. The course of dry eye after phacoemulsification surgery. BMC Ophthalmol. 2015 Jun 30;15:68. doi: 10.1186/s12886-015-0058-3. Chen W, Zhang X, Liu M, et al. Trehalose protects against ocular surface disorders in experimental murine dry eye through suppression of apoptosis. Exp Eye Res. 2009 Sep;89(3):311-8. doi: 10.1016/j.exer.2009.03.015. Cho YK, Kim MS. Dry eye after cataract surgery and associated intraoperative risk factors. Korean J Ophthalmol. 2009 Jun;23(2):65-73. doi: 10.3341/kjo.2009.23.2.65. Crowe JH, Hoekstra FA, Crowe LM. Anhydrobiosis. Ann Rev Physiol. 1992;54:579-99. Elbein AD, Pan YT, Pastuszak I, et al. New insights on trehalose: a multifunctional molecule. Glycobiology. 2003 Apr;13(4):17-27. Epitropoulos AT, Matossian C, Berdy GJ, et al. Effect of tear osmolarity on repeatability of keratometry for cataract surgery planning. J Cataract Refract Surg. 2015 Aug;41(8):1672-7. doi: 10.1016/j.jcrs.2015.01.016. González-Mesa A, Paz Moreno-Arrones J, Ferrari D, et al. Role of tear osmolarity in dry eye symptoms after cataract surgery. Am J Ophthalmol. 2016 Aug 10. pii: S0002-9394(16)30374-9. doi: 10.1016/j.ajo.2016.08.002. [Epub ahead of print]. Han KE, Yoon SC, Ahn JM, et al. Evaluation of dry eye and meibomian gland dysfunction after cataract surgery. Am J Ophthalmol. 2014 Jun;157(6):1144-1150.e1. doi: 10.1016/j.ajo.2014.02.036. Huang FC, Tseng SH, Shih MH, et al. Effect of artificial tears on corneal surface regularity, contrast sensitivity, and glare disability in dry eyes. Ophthalmology. 2002 Oct;109(10):1934-40. Iturriaga G, Suárez R, Nova-Franco B. Trehalose metabolism: from osmoprotection to signaling. Int J Mol Sci. 2009 Sep 1;10(9):3793-810. doi: 10.3390/ijms10093793. Izawa Y, Matsuo T, Uchida T, et al. Atomic force microscopic observation of trehalose-treated and dried corneal epithelial surface. Br J Ophthalmol. 2001 May;85(5):610-612. Jee D, Park M, Lee HJ, et al. Comparison of treatment with preservative-free versus preserved sodium hyaluronate 0.1% and fluorometholone 0.1% eyedrops after cataract surgery in patients with preexisting dry-eye syndrome. J Cataract Refract Surg. 2015 Apr;41(4):756-63. doi: 10.1016/j.jcrs.2014.11.034. Jiang D, Xiao X, Fu T, et al. Transient tear film dysfunction after cataract surgery in diabetic patients. PLoS One. 2016 Jan 15;11(1): e0146752. doi: 10.1371/journal.pone.0146752. Kasetsuwan N, Satitpitakul V, Changul T, et al. Incidence and pattern of dry eye after cataract surgery. PLoS One. 2013 Nov 12;8(11): e78657. doi: 10.1371/journal.pone.0078657. Khanal S, Tomlinson A, Esakowitz L, et al. Changes in corneal sensitivity and tear physiology after phacoemulsification. Ophthalmic Physiol Opt. 2008 Mar;28(2):127-34. doi: 10.1111/j.1475-1313.2008.00539.x. Kwon JW, Chung YW, Choi JA, et al. Comparison of postoperative corneal changes between dry eye and non-dry eye in a murine cataract surgery model. Int J Ophthalmol. 2016 Feb 18;9(2):218-24. doi: 10.18240/ijo.2016.02.06. Li XM, Hu L, Hu J, et al. Investigation of dry eye disease and analysis of the pathogenic factors in patients after cataract surgery. Cornea. 2007 Oct;26(9 Suppl 1): S16-20. Liu Z, Luo L, Zhang Z, et al. Tear film changes after phacoemulsification. Zhonghua Yan Ke Za Zhi. 2002 May;38(5):274-7. Matsuo T. Trehalose versus hyaluronan or cellulose in eyedrops for the treatment of dry eye. Jpn J Ophthalmol. 2004 Jul-Aug;48(4):321-7. Matsuo T. Trehalose protects corneal epithelial cells from death by drying. Br J Ophthalmol. 2001 May;85(5):610-2. Mencucci R, Boccalini C, Caputo R, et al. Effect of a hyaluronic acid and carboxymethylcellulose ophthalmic solution on ocular comfort and tear-film instability after cataract surgery. J Cataract Refract Surg. 2015 Aug;41(8):1699-704. doi: 10.1016/j.jcrs.2014.12.056. Montés-Micó R, Cáliz A, Alió JL. Wavefront analysis of higher order aberrations in dry eye patients. J Refract Surg. 2004 May-Jun;20(3):243-7. Nwaka S, Holzer H. Molecular biology of trehalose and the trehalases in the yeast Saccharomyces cerevisiae. Prog Nucleic Acid Res Mol Biol. 1998;58:197-237. Ohtake S, Wang YJ. Trehalose: current use and future applications. J Pharm Sci. 2011 Jun;100(6):2020-53. doi: 10.1002/jps.22458. Epub 2011 Feb 18. Oh T, Jung Y, Chang D, et al. Changes in the tear film and ocular surface after cataract surgery. Jpn J Ophthalmol. 2012 Mar;56(2):113-8. doi: 10.1007/s10384-012-0117-8. Pinto-Bonilla JC, Del Olmo-Jimeno A, Llovet-Osuna F, et al. A randomized crossover study comparing trehalose/hyaluronate eyedrops and standard treatment: patient satisfaction in the treatment of dry eye syndrome. Ther Clin Risk Manag. 2015 Apr 13;11:595-603. doi: 10.2147/TCRM.S77091. eCollection 2015. Ram J, Gupta A, Brar G, et al. Outcomes of phacoemulsification in patients with dry eye. J Cataract Refract Surg. 2002 Aug;28(8):1386-9. Richards AB, Krakowka S, Dexter LB, et al. Trehalose: a review of properties, history of use and human tolerance, and results of multiple safety studies. Food Chem Toxicol. 2002 Jul;40(7):871-98. Sahu PK, Das GK, Malik A. Dry Eye Following Phacoemulsification Surgery and its Relation to Associated Intraoperative Risk Factors. Middle East Afr J Ophthalmol. 2015 Oct-Dec;22(4):472-7. doi: 10.4103/0974-9233.151871. Sitompul R, Sancoyo GS, Hutauruk JA, et al. Sensitivity change in cornea and tear layer due to incision difference on cataract surgery with either manual small-incision cataract surgery or phacoemulsification. Cornea. 2008 Sep;27(Suppl1):S13-8. doi: 10.1097/ICO.0b013e31817f29d8. Thanna S, Sucheck SJ. Targeting the trehalose utilization pathways of Mycobacterium tuberculosis. Medchemcomm. 2016;7(1):69-85. Tukenmez-Dikmen N, Yildiz EH, Imamoglu S, et al. Correlation of Dry Eye Workshop Dry Eye Severity Grading System With Tear Meniscus Measurement by Optical Coherence Tomography and Tear Osmolarity. Eye Contact Lens. 2016 May;42(3):153-7. doi: 10.1097/ICL.0000000000000168. Yoon SY, Lee JH, Kim KL, et al. Effectiveness and Optical Quality of Topical 3.0% Diquafosol versus 0.05% Cyclosporine A in dry eye patients following cataract surgery. J Ophthalmol. 2016;2016:8150757. doi: 10.1155/2016/8150757. Yu Y, Hua H, Wu M, et al. Evaluation of dry eye after femtosecond laser-assisted cataract surgery. J Cataract Refract Surg. 2015 Dec;41(12):2614-23. doi: 10.1016/j.jcrs.2015.06.036. Luyckx J, Baudouin C. Trehalose: an intriguing disaccharide with potential for medical application in ophthalmology. Clin Ophthalmol. 2011;5:577-81. doi: 10.2147/OPTH.S18827. Perfect JR, Tenor JL, Miao Y. et al. Trehalose pathway as an antifungal target. Virulence. 2016 Jun 1:1-7. (Epub ahead of print). Copyright (c) 2016 Astakhov S.Y., Tkachenko N.V.